Os grid reference: SJ 7587 6082. 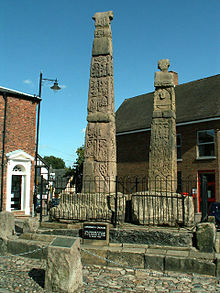 In the cobbled market-place opposite the High Street at Sandbach, Cheshire, and at the back of St Mary’s church – are two tall Anglo-Saxon crosses known as The Sandbach Crosses, said to date from the 8th or 9th century, or maybe even earlier. They are in fact Mercian crosses because this area came under the jurisdiction of that kingdom during the 7th century AD, which was ruled by the pagan King Penda, and his son Paeda, who became a Christian; the crosses being ‘supposedly’ set up to commemorate the conversion to Christianity of Paeda following his business trip to the kingdom of Northumbria where he married a Christian princess called Alchfleda or Ealfleda, daughter of King Oswy. Four northern missionary priests: Adda, Betti, Cedd and Diuma accompanied the newly-married couple back to Mercia, and there the four ‘holy men’ set about spreading ‘the word of God’ in the kingdom of Mercia itself, perhaps even establishing a monastery at Sandbach, according to the Venerable Bede. They appear to have been succesful, especially when Paeda succeeded his father as king of Mercia in 655; Paeda died four years later in 659. The crosses ‘were’ said to have been set-up a few years earlier in 653 AD. Both crosses were heavily restored after being virtually destroyed by Puritans in 1614 and then suffering the fate of being used as building material in various structures, in a well, and even as paving-stones in the town’s streets. The carved, sculptured stones that formed the two crosses were eventually very hurridly taken away to various places in Cheshire (by some eminent local notaries) – before being brought back and re-erected in the market-place at Sandbach in September 1816. But the two sculptured crosses, despite being battered about, are still “outstandingly” well-carved with scenes from the bible and notable moments from royal Mercia in the mid-7th century AD. It is thought highly likely that a third small cross once stood beside the two in the market-place, indeed the pieces of carved stone on the ground beneath St Mary’s church-tower, nearby, may have come from that ‘lost’ cross? The taller of the two high crosses is almost 16 feet (4.8) metres high, while the smaller one is almost 11 feet (3.3) metres high, although they would originally have been taller if they had not lost their cross-heads. The carvings are in varying sized sections (panels) down each face and, although these carvings do not always quite match-up, generally they are pretty good considering what they had been through! The taller cross is made-up of eight pieces of stone, some more recent, standing upon a large base and a stepped plinth, decorated with biblical scenes in sections (panels). At the top there is a broken, round-shaped cross-head, now only a quarter of it remains. The east face is apparently the most interesting, maybe because it deals with Christ’s crucifixion, his baptism, and also “his” transfiguration in early Christian motifs. In the centre Christ on the cross with the two Mary’s at his side, and the emblems of the four evangelists formed by the limbs of his cross, while below that Jesus in the manger, with an angel above and an ox at each side. At the top, just below the head, two mutilated figures and, below that the intruments of the passion – a hamer and pair of pincers. Toward the bottom ‘The Annunciation of the Virgin Mary’ and above her the holy ghost in the form of a dove. Below that a circle with the Virgin Mary, St Elizabeth and St John. The west face shows Christ’s passion: near the top four figures may be the evangelists, while further down Christ is bound with a cord, with a man in front dragging him (by the cord) towards Pilate. At the centre Simon of Cyrene carries the cross, and in front of him a figure carrying a club, or a lance, and just below the middle the Angel Gabriel visits Zacharias (seated) in the temple; the bottom panel shows two dragons. The north face has ‘The Descent of the Holy Ghost’ with a long-tailing dragon; the other panels going downwards have ten Apostles in two columns, each in his own compartment but on a different level, although ‘seemingly’ able to communicate with his neighbour! And the south face is adorned with interlacing, filigree work, and vine-scrolls, and a number of animals trapped inside the scrolls – representing John the Baptist in the Wilderness. The smaller cross is largerly a 19th century reconstruction, its broken Maltese-style head may have come from a third small cross. It is made up of many panels in which there are numerous creatures and human figures. The north face depicts Paeda’s journey to the north. At the top two dragons with their tongues interlinked, below that two rows of compartments or rooms with a figure inside (walking), some carrying dagers in their hands. While the south face shows more figures, these ones quite well-carved and clear, in arched compartments and holding staves, while at the bottom two angels are looking upwards. 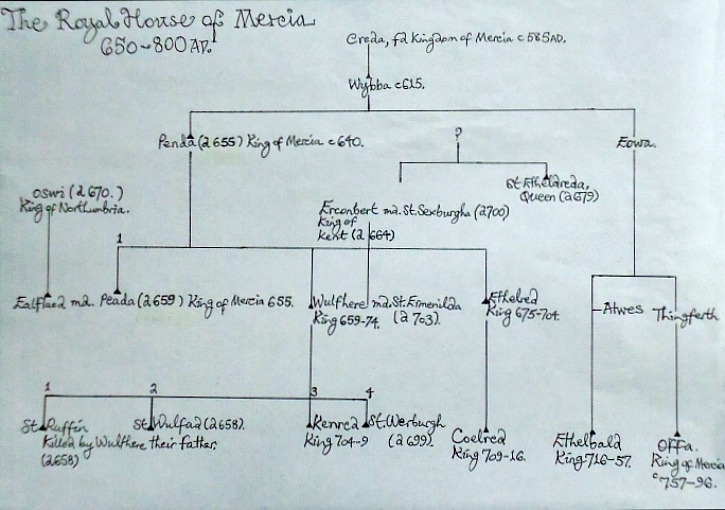 The Royal House Of Mercia. The east face consists of five diamond-shaped compartments. At the top a bull (meaning strength) with its head inclined backwards, while below that a human figure inside the diamond-shape with his hands ‘going’ into his sides, maybe representing King Penda, and above and below the king’s noblemen. 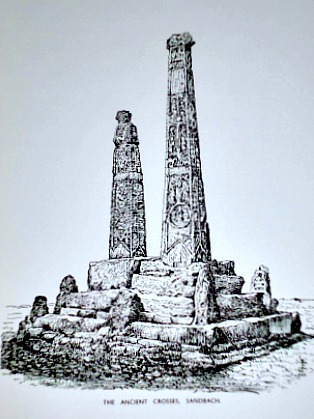 In the centre of the cross Alchflaeda, princess of Northumbria, with her two attendants. At the bottom King Paeda of Mercia in a diamond-shape with two noblemen. The west face is damaged at the top, but the lower section is very good. Here we have the conversion to Christianity of Paeda with a dove coming to rest on his shoulder, while below him in arches are his many followers, and at the bottom two angels looking up. Anderton, Bill., Guide To Ancient Britain, Foulsham, Slough, Berkshire, 1991. Burgess, Rodger., Cheshire – Secrets from the Past, Sigma Leisure, Wilmslow, Cheshire, 2000. Egerton, E, Miss., The Saxon Crosses – Sandbach, Cheshire – An Illustrated Description And History (2nd Edition), Chester, 1934. (Reprinted by: The Rotary Club of Sandbach, December 1986). Categories: Ancient Crosses | Tags: The Sandbach Crosses in Cheshire | Permalink. It all depends on what you have in mind. But, yes it is a possibility.